Help out your local RIDE! Pick your location and 3 positions you think you'd like. You can still register to fundraise if you're not riding or walking! A local captain will contact you about your position. MobileOnly include if you are willing to use it on RIDE Day at your own expense. Additional CommentsAnything else we should know? Please carefully review the following waiver. You must agree to the terms and conditions below in order to participate in this event. 6. In consideration of the acceptance my participation in the Event, I, for myself, my heirs, executors, administrators, successors and assigns waive any claims to which I may become entitled for injury or damage or other liability regardless of cause and release Blue Sea Philanthropy Inc., the local host charity, or organizing committee members (referred to collectively hereinafter as the “Organizers”) and all other organizers, sponsors, representatives, their agents and employees and any other person or organization assisting in this Event from any claims for damages or injury suffered by me as a result of my participation in or travelling to or from this Event. 7. I give my permission to the Organizers to use of my name and picture in broadcast, telecast, internet, mediated or written account of this Event. 8. For Participants under the age of 18 years: In consideration of the Organizers accepting the participation of the above-named Participant in the Event, I, a parent/guardian of the Participant, agree to indemnify and save harmless the Organizers, their directors, officers, members, servants, agents and employees from and against any claims or demands which might be made against any of them, arising out of or in consequence of the attendance or participation of by the Participant in the Event. Volunteer registration is officially full in this location. But, you may still contact your local event director in case they have a spot for you - check your location's page under the Contact Info section. 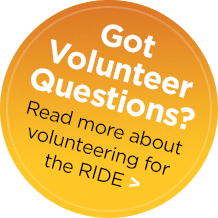 And don't forget, it's not too late to join us on RIDE Day - register now!